A V-belt’s purpose is to transmit energy between two components. 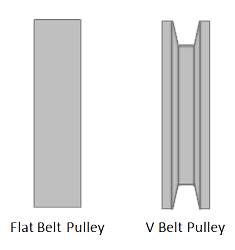 What makes a V-belt pulley stand out from other types of pulleys, such as a round belt or flat pulley, are the V-shaped grooves of the pulley; these grooves guide the belt and allow it to gain traction. The number one cause of a power transmission belt failure is improper tensioning. In order to ensure a long and efficient belt operation, you must properly learn how to tension a V-belt regularly. If they are too loose, there is slippage, rapid belt or sheave wear and, ultimately, loss of both energy and productivity. Conversely, if there is too much tension, the excess strain on the belts, bearings and shafts causes premature wear of these components. The proper tension is the lowest tension at which the belt won’t slip or squeal under peak load. However, there is still a wide range of tension between these two extremes in which a drive will operate sufficiently. The primary goal of learning how to tension a V-belt is to find this happy tension medium. Important Note: Never apply belt dressing, as this will damage the belt and cause early failure. Always keep the drive free of foreign material which might cause slippage or damage to the belt and sheave surfaces. This is the preferred method of our customers. This tensioning method relies on a Pencil Gauge Tool and the mathematical standards laid out in this v-belt tensioning table. Measure the span length “K” of your drive (See Figure 1). the scale and slide the small O-ring up against the barrel of the gauge as shown in Figure 2. Place the large end of the tool onto the belt at the center of the span. Apply a sufficient force to deflect the belt until the large O-ring is in-line with the other belts. If this is a single-belt drive, use a straight-edge or taught string for a “starting point” reference. Then, release the pressure and read the deflection force from the position of the small O-ring on the plunger scale as shown in Figure 2. Compare this force with the value given in the v-belt tensioning table. If the force is below the recommended value, increase the drive center distance to provide greater belt tension. Reduce the center distance if there is too much force. For example, for a 100″ span, the deflection would be 100/64″, or approximately, 1½”. This method is IBT’s recommended choice for precision tensioning and time efficiency. Pristine accuracy will best help you achieve belt longevity, ultimately saving you money. A Belt Tension Meter is a hand-held device that has two elements: an optical sensor and a meter. It is designed to detect the vibration of a belt using an infrared invisible beam and a light that allows you to aim it. The first step is to load the belt’s span and mass data into the meter. Mass data can be obtained from any belt manufacturer and varies between them. Aim the sensor as close to the center of a selected belt span as possible in order to get the most accurate tension reading. The best practice is to orient the sensor with the long edge parallel to the belt centerline with approximately a ½˝ gap. Using too short of a span could yield false tension readings that may be much higher than the actual belt tension, due to effects of belt stiffness. If the top surface of the belt is not easily reachable, beaming the sensor against the edge of the belt functions equally as well. Tap the belt, using the handle of a small tool or something similar, to make it vibrate for a reading. The meter will report the belt tension in units of force. On new installations, hand rotate the system at least one full revolution of the belt in order to seat and normalize the components. When tensioning an array of V-belts, use a single belt toward the center. Banded belts are to be treated as a single unit with the belt mass constant calculated as a multiple of the single belt value. Take three successive readings for consistency purposes. If the readings vary by more than 10%, reassess your measurement technique. The meter will not give a measurement reading for a belt under extremely low tension. If the meter is not responding, simply increase the drive tensioning until the meter responds. The best way to do this method? Don’t. We mention the “thumb test” method (using your hand or thumb to apply pressure to the belt as a way to judge whether or not it has the correct amount of tension) because many traditional businesses still practice this style of V-belt tensioning. When it comes to getting the most life out of your belts and maximizing the operational efficiency of your business, we do not recommend that anyone rely on anything less than the precision tensioning tools mentioned above in methods #2 and #3. 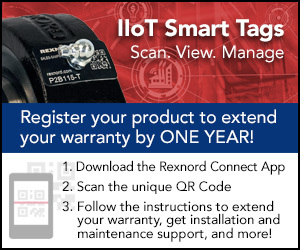 While the “pros” of this method include the initial money and time savings gained from this simple procedure, as opposed to investing in a tensioning tool, the cost build-up of having to replace your belts frequently will ultimately overshadow this, consequently increasing downtime from belt failure. ContiTech offers a high-quality tension testing tool. Designed for the tension testing of a drive with two or more belts, this pocket-sized tool measures V-belts from 10” to 170” and up to 35 pounds of tension. Measure belt span and measure the force required to deflect any one of the belts 1/64” for every inch of span length. 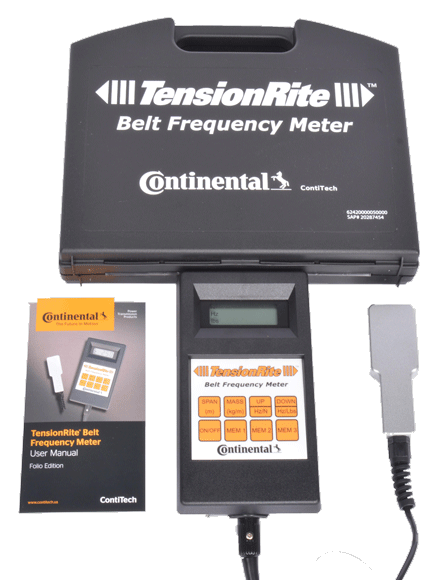 The TensionRite® Meter, from the trusted brand of Continental ContiTech, provides a simple, repeatable and reliable method for tensioning belts using optical technology. It is capable of both measuring all belt styles, from all manufacturers, with vibration frequencies between 10Hz and 400Hz. The IRPG team at IBT Industrial Solutions fabricates and services conveyor belts every day—offering both heavyweight and lightweight options—for all types of industries. They also cut and crimp a wide variety of industrial hydraulic and pneumatic hose at our KC Hose Shop facility, which is a ContiTech STAR facility, exceeding criteria for cleanliness and hose safety as set forth by NAHAD and certified by Underwriters Laboratory. We have the inventory and expertise to service all your belting and hose needs. Have questions or want to learn more about how to tension a V-belt?